Born and raised in Rochester, NY, Mike realized he wanted to be a chef at a very young age. His first job was at a local pizzeria when he was just 15 years old. He knew it wouldn’t be easy, but with hard work, dedication, and perseverance he could work his way up the ranks. Real world, hands-on, on-the-job training and education is how he learned the industry, and grew to become the culinary professional he is today. He has worked in many different settings, including multiple various restaurants (from short order to fine dining), high-end luxury hotels, and exclusive country clubs (a local platinum golf club included). Mike’s twenty-one years of diverse culinary experience is a valuable asset to our team. Mike found his passion for all things culinary very early in life. Some of his earliest memories include “helping” his grandfather, a WW2 veteran and retired dairy farmer, in his expansive garden and workshop, and spending time with his grandmother in the kitchen as she cooked for the family and baked cookies and pies that were so good, they actually inspired him to want to cook! He also spent much of his childhood contributing to the planting, cultivation, harvest, and processing (canning, freezing, pickling etc.) of his family’s extensive vegetable valuable life lessons, instilled in him a dedicated, determined work ethic, and inspired in him a deep passion and respect for all things food that have stuck with him to this day. Mike loves learning about different cultures, and experiencing their cuisines. A chef decidedly committed to his profession, he takes pride in his craft and always strives to deliver a great experience to every one of our clients. 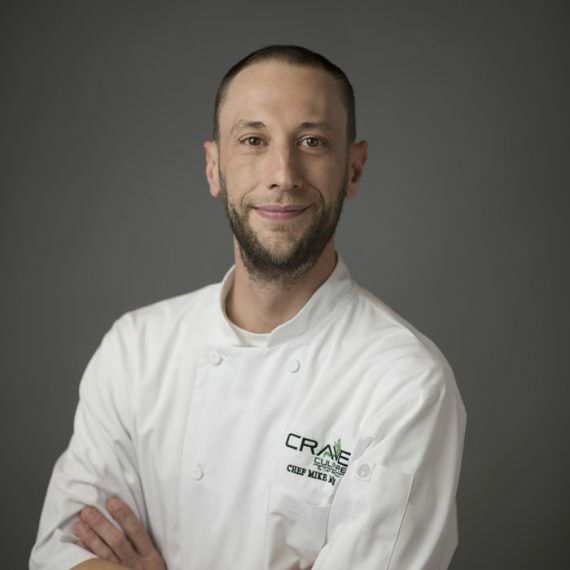 He is meticulous in assuring that the standards of Crave Culinaire are not only met, but exceeded whenever possible, and always strives to deliver the best culinary experience to our guests. His genuinely positive attitude and upbeat spirited demeanor are truly inspirational to all. He is always happy to assist others, no matter the task at hand. He is patient when coaching co-workers and eager to help them further their culinary skills, technique, and knowledge. Believe it or not, Mike even met his wife in the kitchen! It was during his six years (five as sous chef) at The Sagamore Resort on Lake George, NY (a four-star hotel, Historic Hotel of America, and Preferred Hotel). She, a fellow chef, came to the US on a work visa from Mexico City where she obtained her degree in culinary arts from the most respected culinary university, and graduated at the top of her class. After she graduated, she dediated everything to earning a highly coveted externship in Monaco where she studied under Joël Robuchon, a world renowned three Michelin starred chef. Needless to say, Mike’s interest was immediately piqued when she was assigned a position in his kitchen. The rest, as they say, is history! Now married for three years, they are eagerly awaiting the arrival of their first child (a daughter, Zoey)! Mike’s story just goes to show that no matter where we find our inspiration, we can also find our passion.